Last weekend we watched “TheMan Who Knew Infinity” which is based on Robert Kanigel’s marvelous biography of mathematician Ramanujan by the same name. It’s a very good production, and while it takes some liberties with the facts, it brings one of the most extraordinary characters in the history of science to life in the 21st century. The movie is not exactly Oscar-level Hollywood material, but this fact makes it an even more notable undertaking. The story virtually writes itself: poor Indian man from obscure village at the turn of the 19th century possesses an amazing gift that few recognize. Fortunately – and largely by sheer chance- his gift gets recognized by one of the world’s most famous mathematicians, G. H. Hardy. Hardy then invites him to Cambridge where the two embark on a singular collaboration that unearths deep mathematical secrets, but debilitated by the weather and his exceedingly fastidious vegetarian food habits, Ramanujan returns home to India and dies at the tender age of 32; but not before being elected a fellow of both the Royal Society and of Trinity College in Cambridge, an unprecedented honor for a self-taught man from a village in British-occupied India. Even without embellishment the story is quite memorable, and yet as often happens with math and science, even today it’s known to few people in any kind of detail. The emphasis on the film is on Ramanujan’s relationship with G. H. Hardy, and this aspect of his life was as remarkable as his mathematical prowess. There was a Q&A session with Robert Kanigel, the film’s director Matt Brown and the mathematician Manjul Bhargava (who won the Fields Medal last year) after the film, and the director told us that what really inspired him to make the film was this human story describing the bonds of mathematics that could bridge the gulf between two very different men from very different cultures. Hardy calls his association with Ramanujan “the one true romantic incident of his life”, and the film does give us an idea of why he might have thought so. The movie also does a good job dwelling on the math which is really the meat of Ramanujan’s life. To its credit it actually features an actual explanation of one of Ramanujan’s greatest accomplishments - his work on partitions with Hardy. Ramanujan’s ability to divine great theorems virtually from scratch was legendary of course, and even today mathematicians are finding gems in his books and wondering how he could figure out all these counterintuitive and novel math results based on nothing more than a high school education. Like John von Neumann Ramanujan was the ultimate autodidact, and both his and von Neumann’s accomplishments really give us a flavor of the extraordinary hidden potential that human minds hold. But one crucial aspect of Ramanujan’s personality that the film shines light on is his sheer obsession with math and the immense amount of hard work that he put in. Almost all through his adult life until his death, math was all he did. Ramanujan was a bona fide genius, no doubt about that, but the way he ate and drank and breathed and lived math makes it clear that even geniuses’ accomplishments come only from great toil and effort. The real message of both the book and the movie is that genius can shine even in the most unlikely and obscure corners. Beyond a point it was clear that it was sheer fate and recognition by Hardy that allowed Ramanujan to be who he was, and one wonders how many other talents are wasting away today in little known towns in Africa, India or China. Someone like Ramanujan comes along only once every hundred or two hundred years, but ignoring even half a Ramanujan from any of these corners of the world would be a terrible waste of human potential. That’s one of the reasons I am encouraging everyone I know to watch the movie. The other reason is director Matt Brown’s dedication to making it. One thing that definitely came across from the Q&A session was that this project was a labor of love. It took 12 years to make and, considering the low financial expectations that the people who made it must have had from it, really needed a lot of dedication and commitment. 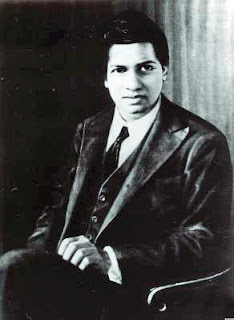 At one point the movie came close to being funded, but what (rightly) prevented it was a funding source's insistence that the storyline include an affair between Ramanujan and a white nurse at Cambridge (played appropriately by some British actress with star power) to improve its financial potential. The director told us that it was Ramanujan’s feelings of isolation in chilly Cambridge that impressed themselves upon him when he was caring for his brother who had cancer (in a happy real life twist, his brother got better and composed the score for the film). It was clear that he truly believed in it. Brown asked us all to publicize the movie since it’s playing for only three weeks or so (next weekend might be the last one) and I do think this is important. It’s important not just for the dedication that went into it, but more importantly because I think it’s awesome that someone has made a movie about mathematicians and math and tried to show both the beauty of math and the human stories behind it: How often does this happen? I therefore think that we as science writers, journalists and scientists should do all we can to encourage its wide publicity. To this end please make sure you watch the movie and publicize it as much as possible when you get a chance. This has been a public service announcement. "... how he could figure out all these counterintuitive and novel math results based on nothing more than a high school education ..."
Wasn't his own claim that he recieved his education from his beloved goddess Namagiri? And even if goddesses are archetypes, ontologically speaking, rather than objective, supernatural entities, isn't his claim worth a mentiuon? Kanigel's book devotes some pages to it, doesn't it?